This is A1! The best comes in small packages. B-Band has always thought small and unobtrusive, to let the wood work. A direct descendant of the classic Core99 preamp, the new, single input, A1 preamp has a direct frequency response and 21 dB of gain. The electronics are mounted in a very small tube that is directly coupled with a high quality endpin jack making an all-in-one structure. This makes for easy mounting without adding much mass to the instrument. Mated to either a UST or AST, the reproduced sound is amazingly clear and pure. For users, the Core99 has been vital for their performance. Further, significant, changes and updates have been made to enhance this performance – the new A2 is the better result. The two input A2 preamp allows for an UST / AST combination: a new way for all of instrument's nuances to be reproduced, making the sound more alive. This system gives the player more freedom at high sound levels while retaining all the qualities of the former UST / sound-hole condenser mic system. 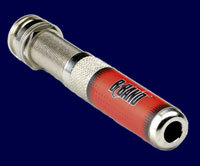 The B-Band UST / AST are accessed separately with the use of a standard 1/4" stereo cable. 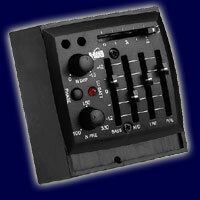 Both outputs are compatible with virtually all outboard equipment inputs. By using a 1/4" mono cable both signals are mixed in one. The A2´s UST channel has a unique contour filter for upper register tone enhancement. Inside there is a DILswitch for switching a high frequency (HF) enhancer on or off. When the switch is in the off position, frequency response is flat. When on, the HF enhancer gives a mild boost to the highs. The A2’s preamp second channel will, if preferred, accept a sound-hole condenser microphone or magnetic pickup as an alternative to the AST. There is DIL-switches to turn on bias voltage for the mic, to turn on a highpass filter for microphone feedback reduction, and to lower the gain from 24 dB down to 0 dB. The A2 kit provides a high quality Switchcraft® endpin jack, all mounting hardware, 9-volt battery clip and wire harness. 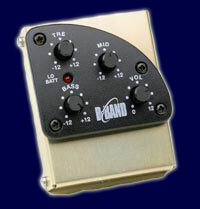 B-Band Condenser Microphone can be used instead of AST on A2 preamp’s 2nd channel. Breaking away from B-Band’s heritage, the A3 is pure tradition. In respect to all previously made tone designs, the A3 brings together the modern with the future, by melding a in-line 3-band qualizer with B-Band transducer technology. Formerly called 3Tone, the A3’s new graphic EQ design, with rotary cut / boost bass, middle and treble controls, has the mid and treble controls affecting the higher frequencies more than before and features linear potentiometers for greater range. Simple in thought, comfortable to use but powerful to the ear, this single input side mount preamp works with a choice of UST or AST. A Lakewood Guitar comes with completely installed pickup system, with all hardware and includes a Switchcraft® endpin jack with battery power switch. powered by a 9-volt battery. The included custom battery clip is made of spring-steel, is mounted to the back of the pre-amp and has a safety belt for the battery. For quicker battery changes, an optional side mount battery box can be ordered. Nominal output level: -10 dB ref. 775 mV r.m.s. The B-Band A5 is for the player who takes a more straightforward approach to their sound and wants more EQ possibilities. The single input A5 takes its basic design from the A6 and can be used with either a UST or AST transducer. 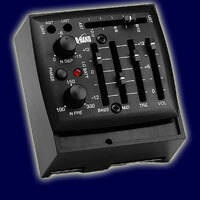 Easy to view and use slider controls are used for the volume and the 4-band EQ. The volume slider is at a right angle from the EQ sliders controls providing a "smart" read and use for quick changes. Rotary feedback controls, notch depth and frequency, differentiate the control field for less control error. Nestled between the rotary knobs there are a phase switch and a low battery LED. All Lakewood guitars are now equipped with a battery compartment near the output jack (lower bout). It houses the 9V-battery that supplies the preamp. The A6 preamp is something totally different from what B-Band has done in the past. Raised from the beginning to give guitarists everything they need from their fingertips to their ears. The sonic journey starts with A6's support for a B-Band UST / AST transducer combination. This combination achieves the best reproduction, with more freedom at higher sound levels, of a universe of sound called The Acoustic Guitar. For total sound control, the A6's tactile controls include sliders for volume, 3 band EQ and UST / AST mix. The volume slider is at the nearest edge to the soundboard and is at 90 degrees from UST / AST mix control for fast virtual access. Rotary feedback controls, notch depth and frequency, differentiate the control field for less error. Nestled between the rotary knobs is a phase switch. Dual gain trim controls, at the control field, makes perfecting the balance of the UST / AST combination easy. The A6 comes with a high quality endpin jack with battery power switch. Mono output provides a two-channel (UST / AST) mix. All A6-equipped Lakewood guitars are powered by a 9V battery that sits in the battery compartment near the output jack (lower bout). Guitars with the systems A3, A5 and A6 had battery compartments in the lower bout near the end block. 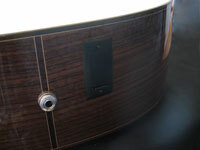 Guitars that have been equipped with those systems before 2003 have no battery compartment, but the battery sits inside the guitar on the rear of the preamp, held by a metal clip.